Firing up a crowd of 35 in a Salvation Army gymnasium in Pittsburgh’s West End Saturday, Rev. Richard Freeman wanted to make one point clear about his friend and mayoral candidate, Rev. John Welch. Welch’s month-old campaign is one of three competing for the Democratic nomination for mayor of Pittsburgh. As the current mayor, momentum is on Peduto’s side for the May 16 primary. In the past, Pittsburgh voters have never unseated an incumbent mayor. In his third public rally, Welch started to bring up the issues that animate his “people’s campaign,” from the city’s ongoing lead crisis, overuse of student suspensions by Pittsburgh Public Schools and his aversion to the Peduto administration’s handling of these issues — though he never mentioned Peduto by name. Welch, Pittsburgh Seminary School’s dean of students, started his speech by bringing up Pittsburgh’s lead crisis and attacked the city government’s slow reaction to the crisis. “I don’t think we can afford another four years of those people,” Welch said of Peduto and city council. In a post-rally interview, Welch said under his leadership, the PWSA “may or may not exist as it is” right now. Welch said more regional and state authorities need to be part of any solution for the city’s water quality issues. In a statement Feb. 3, Peduto announced an advisory board to find new ways for the PWSA to operate, in light of high lead levels, bad billing and the recent boil advisory from low chlorine levels. In the release and subsequent interviews, Peduto has toyed with setting up a public-private partnership to manage Pittsburgh’s water as a solution. Welch, however, was adamant that under him, all authority would stay within the city government. “I don’t want to have anything private involved in our water system,” Welch said. 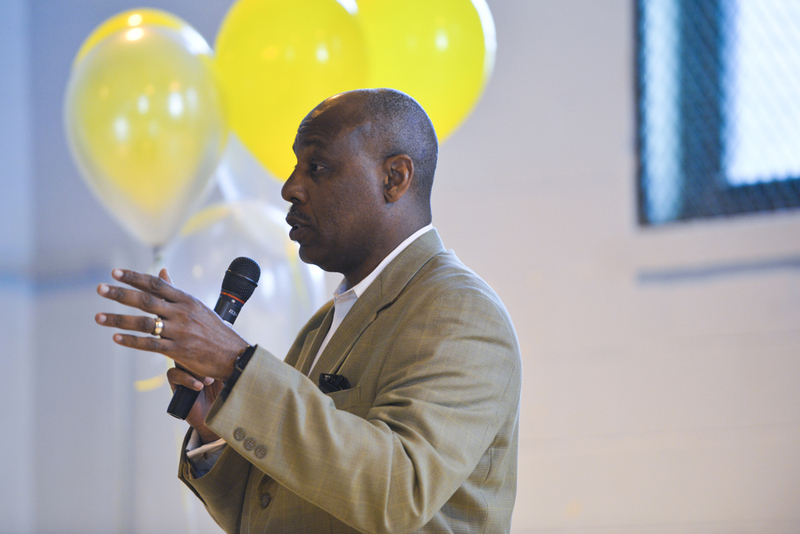 Focusing in on education, Welch said as mayor, he’d increase cooperation between City Hall and Pittsburgh Public Schools to decrease the use of suspensions as punishment, especially for non-violent offenses. According to Education Rights Network, a Pittsburgh activist group, 79 percent of students suspended in grades kindergarten through fifth grade — 10 percent of all students — were African American. “We need a partnership between the mayor’s office and the superintendent’s office, so we can stop these ridiculous school suspensions and make sure our kids stay in school,” Welch said to chants of his name. To fund his proposed changes, Welch said in the interview he was willing to tax Pittsburgh’s biggest employer and “the one non-profit that really is a for-profit” — UPMC. A previous version of this story said, “According to Education Rights Network, a Pittsburgh activist group, 79 percent of black students have served a suspension by fifth grade.” This is not true, as 79 percent of students suspended in grades kindergarten through fifth grade — 10 percent of all students — were African American. These changes have been made to the online version of the story. The Pitt News regrets this error.